Why Buckhorns Grow on Trees? If you take a walk casually in the tropical rain forests, it�s quite probable that you may suddenly find bunches of verdant leaves growing on the big branches of a tall arbor. Some leaves may grow upward, and some may drop down. The top of each leave splits into two parts, and each part splits into two smaller parts; the shape of the leaves looks quite like the horns of a red deer. This plant is called staghorn fern. It is a very famous wild ornamental plant and a Class B protection plant of the state level. Though staghorn ferns take big tree trunks as their home, they do no harm to tall arbor trees, because they are only aerophytes instead of parasites. They can support themselves depending on the nutrition carried to them by rainwater and the flowing of air, so they have no need to absorb the nutrition of the tall tree they are growing on. 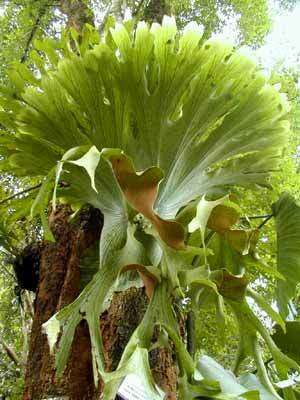 The first discovery of staghorn fern in China took place in the original forests in Daying River of Yunnan province. Since staghorn ferns often grow on the forks or knurs of the trees, the local people also call them �the clothing of trees�. Until the present, there is still a moving story spreading in the Sino-Laos borders about the �clothing of trees�: a young lad and a young girl loved each other; however, their love was strongly opposed by the family members of each side. Because of this, they eloped and entered the forest, where they expressed their love to each other. They ate wild fruits and drank springs in the forests, and became exhausted 10 days later. Finally, they came to a river, took off their clothes and hanged them on the tree; and then, embracing with each other, they drowned themselves. Afterwards, their clothes became the �clothing of trees�, i.e. the staghorn ferns. Therefore, on the Sino-Laos border, the �clothing of trees� is a warning to the parents that the parents should not hold back their children�s marriage; in case the parents really oppose the children�s marriage, the children will tell their parents: �go and have a look at the clothing of trees�. There is a very big lake in Xishuangbanna, whose name is �Manhai�, meaning �a village� in Dai dialect. What�s the relationship between the lake and a village then? This is yet another story about the staghorn fern. In ancient times, this area was a Dai folks� village named �Manhai�. There was a kind-hearted widow in the village and she led a hard life with her two daughters. One day, at dusk, a golden red deer appeared in the village and it had a pair of beautiful horns. It stopped here and there while walking as if it was enjoying the views. When the villagers found the red deer, they all came along and attacked it. The widow tried her best to persuade the masses: �The red deer is an auspicious animal; it will bring us happiness. Never harm it!� But all the villagers turned a deaf ear to her, and the red deer was killed soon. The villagers ate it in the same evening, but they did not let the widow have her share. They argued that: �Your family has no man to take part in the hunting, so you can not share the meat with us�. (According to the local custom, women could not go hunting�. During the night, when the widow was sleeping with her younger daughter, her elder daughter was talking love with a young fellow downstairs. (According to the local custom, a lad could visit a young girl during the night). All of a sudden, the widow was awakened by the sounds of a flood. She pushed the window open, and saw the whole village was in flood except her house. The lad downstairs was quite anxious, and wanted to take his girl friend away immediately. The elder daughter was reluctant to go and she told her boyfriend: �Please go away. I want to stay together with my mum and my sister. We will stay together even we would die!� Her boyfriend had to go by himself. But he could not manage to go out no matter how he tried, because he would be stuck in the mud every time when he moved his feet. Then, his girlfriend shouted to him: �Give my wristlet back�. The lad had to take off their keepsake and threw it to her. Immediately after that, the lad was free and he left the village quickly. At that time, the widow and her younger daughter were stepping down stairs, and then they joined her elder daughter and walked out of the village in a hurry. The water would make room for them wherever they went, while the houses and land behind them gradually sank into water. When they got out of the village, they turned back and found the whole village and the land had gone. The village turned into a spacious and calm lake. Afterwards, the lake was named �Manhai�. On the trees along the banks of the lake, many staghorn ferns, which look like the horns of the red deer, grew out. This might be a real story, because until the present, the fishermen on the lake often find their nets broken by sticking pillars and rafts lying in the bottom of the lake.